Here are some software that have been used and tested with the LongMill. 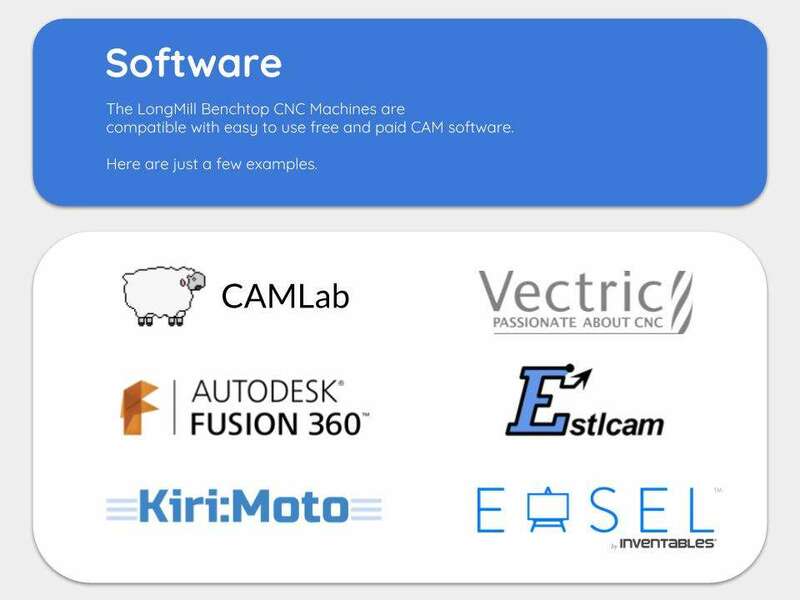 The LongMill is compatible with virtually all CAM software that creates gcode. These are the ones that we have used and tested. Sienci Labs built CAM program that makes it easy to create toolpaths from STL files on the cloud. Based on Kiri:Moto. Inventable’s Easel is a cloud based design and CAM program that lets you make simple 2D designs and toolpaths easily. Autodesk’s CAD and CAM program is a great, very advanced CAD and CAM software that allows you to create toolpaths for 3D models. Fusion 360 allows you to use thousands of tools with advanced toolpathing such as adaptive cutting. Carbide 3D’s simple and easy to use 2D design and CAM software. Allows importing of DXFs and SVGs. Great option for v-carving. Free and open source engraving and v-cutting software created by Scorchworks. Makes it easy to make signs, and allows importing of bitmap images (JPG, BMP, PNG) and vector images (DXF) that can be engraved and/or v-cut. Simple web based application to create toolpaths from SVGs. Works well with Inkscape and Adobe Illustrator. Perfect for creating quick 2D toolpaths. CAM software created by Christian Knüll for 2D and 3D milling. Includes some advanced features like threadmilling and trichoidal milling. Vectric makes a whole host of design and CAM software for advanced hobbyists and professionals that allow for features like v-carving, 3D carving, inlays and more. Have software you want us to try out? Send us a message!